I don’t know about you, but the first recipe I follow tends to be the most complicated one – the one that requires a special trip to town to get all the ingredients. But in the end, it’s often the simple, all-the-ingredients-are in-the-kitchen-already recipe, the fix it and forget it recipe, that everyone loves best. 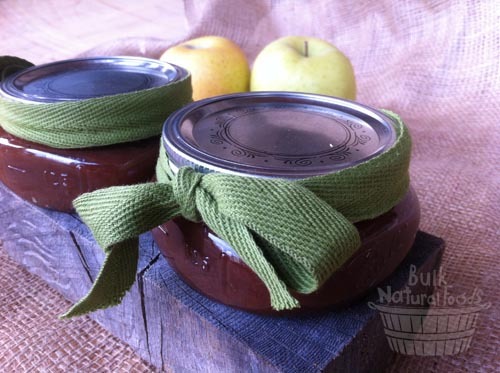 This apple butter is made from only apples and spices that take only minutes to toss into the slow cooker. With no fuss at all, you can enjoy this gourmet spread – the best we’ve ever tasted! My first apple butter experiment was made the conventional way where you’re supposed to make applesauce and then cook it real, real slow on the stove until it thickens. I don’t know if I’m the only one who has better things to do than babysit a simmering pot of apple butter, but every single one of my first apple butter experiments burned horribly. This recipe is quite the opposite. No need to make the apples into applesauce first, and you certainly don’t need to stand over the stove. 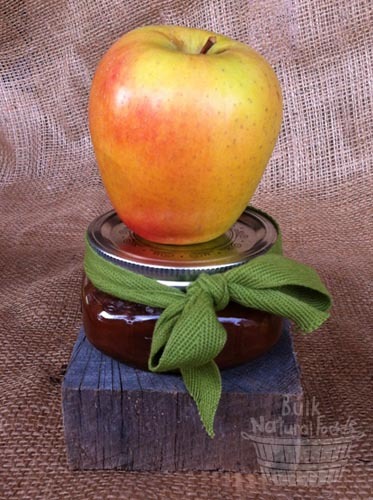 No sir-ee, this apple butter is easy peasy. In one of my experiments I didn’t even peel the apples, and it turned out just as tasty, but I had to blend it in my VitaMix to hide the peelings, and we didn’t like the pureed, baby food texture. It also seemed to me that the liquid just would not evaporate enough when the apples were unpeeled. So I’d recommend that you start with peeled apples. 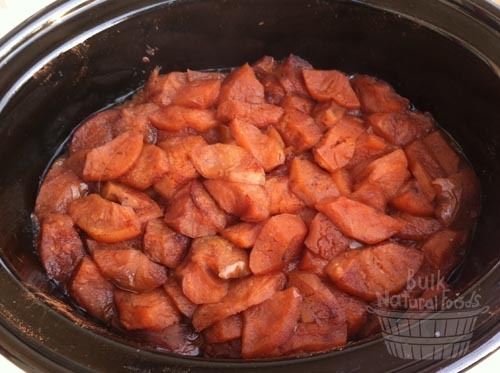 Knowing it would be easy to add sugar at the end, I left the sugar out in one of my slow cooker apple butter experiments, and it was phenomenal. So there’s no sweetener of any kind in this recipe. If you’re using our fresh-from-the-farm apples, I think you’ll agree that no sweetener is needed, but feel free to add up to half a cup of sugar or rapadura if you really think it needs it. 1. Put the cut up apples and all of the spices in your slow cooker. Turn it on low and allow the apples to cook down until there is very little liquid in the crock. Mine took 19 hours start to finish. Tip: If you start in the evening, you’ll have all day the next day to check on it. The longer you cook it, the thicker it will be, and you want it to be nice and thick and spreadable. If there’s still quite a bit of liquid amidst the apples after 15 hours or so, tip the lid on your slow cooker to allow some evaporation. I actually kept cooking the apples in the picture below until the liquid was not visible on the sides anymore. My apples got more brown than this too, but I didn’t take a picture right before I whisked it into apple butter. 2. The apples will be completely soft after all this cooking. All that is needed now is to puree or mash them. 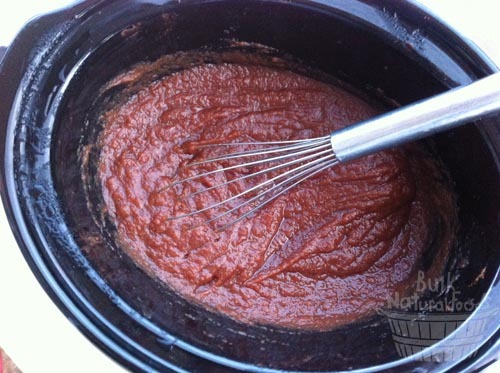 I did this with a whisk as I decided my potato masher left the apple butter too lumpy. 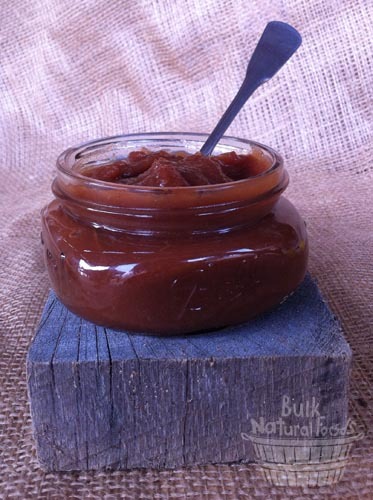 I would not recommend using a food processor or blender for this step just because the apple butter will become as texture-less as baby food. It’s better when it has some texture. 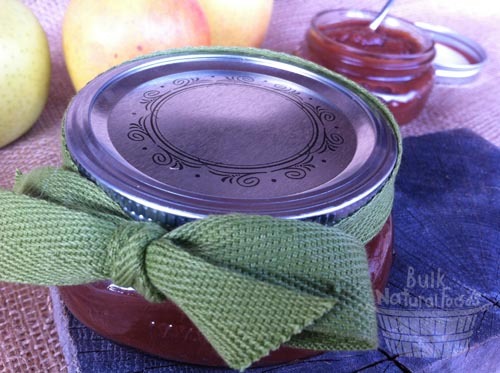 Hi there…What size jars did you put apple butter in and how many jars did you get out of one batch ? I didn’t actually put it all in jars, so I don’t know the answer to your question. Sorry!